It’s time to look at the first of 3 Equestria Girl shorts. Initially I was going to review the 3 specials as one post as some sites seem to list it as season 1 episodes 1-3, but at the same time it’s hard to find an actual title for what that series would be. It sort of tows the line between being 3 separate specials and a quick miniseries. To make it simple I figured I would just treat it as 3 quick specials. As such these reviews will be a bit smaller since it’s like reviewing an episode. In this special, the Mane 7 are trying to earn some money to repair Camp Everfree after the events of the film. Unfortunately things are not going very well on this front. The group has not made a lot of money and the deadline is almost here. That’s when Rarity has the idea of entering a Dance competition where the grand prize would give them all the money they need. The risk is that the entry fee will clean them out so they either win it all or lose everything. The rest of the MLP members reluctantly agree to this. Rarity is confident that they will win, but another wrinkle is thrown into the plan when a group of rival classmates steal Rarity’s idea for the show. With only minutes remaining, can Rarity think of a way to still claim first place? This plot has been used before in the main series where some characters stole Rarity’s ideas as well. As she has the mark of generosity that makes her a very easy target for hooligans like this. It can be a bit annoying to see Rarity so oblivious, but this is why she isn’t the leader of the team. You can bet that this wouldn’t have worked on Sunset Shimmer or Starlight Glimmer. It’s a good conflict here as the heroes can naturally go and beat these kids up with their super powers or they can make the heroic call and let them be. I’d at least report them, but it’s your word vs theirs which makes things fishy. Alas, this special isn’t really about big conflicts and such. The heroes decide to help the bullies out anyway since they were so desperate. It turns out that these students weren’t so bad after all and all of that. It’s a bit hard to swallow of course, but I suppose it is what it is. The Mane 7 have always been pretty good at forgiving people so it’s not exactly surprising that it would play out this way. I do think Sunset was ready to fight if necessary though which is why she’s such a good character. This was a good way to start off the trilogy as we got some good musical beats during the dances. The special had a lot of energy throughout and had good writing. 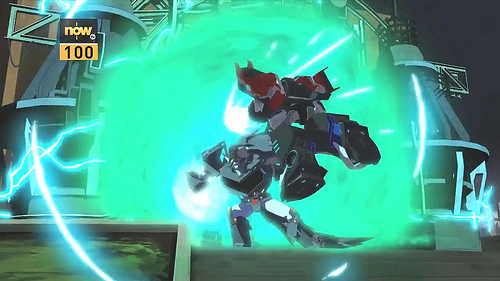 The animation looks pretty similar to the movies although naturally it’s not quite as detailed. It’s bright and colorful which is the important thing. 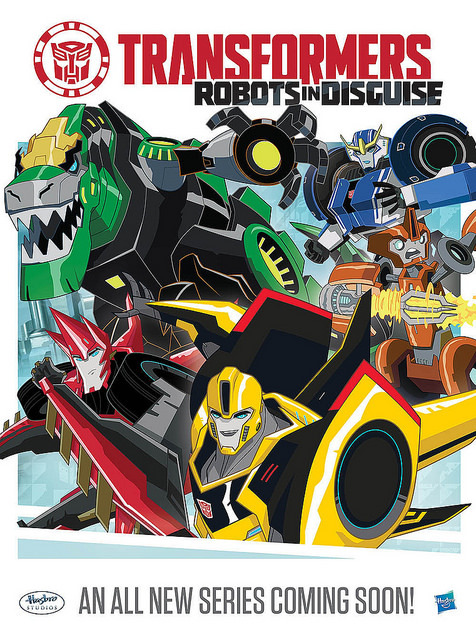 I’d compare the animation to Rescue Bots or something of that nature. It won’t be winning any awards, but it’s not bad either. From the villains, Sugarcoat is annoying though. She’s not grateful in the slightest and is quick to mock the heroes even once they are all on the same side. She seems to think that she is a little better than everyone else and her arrogance is unwarranted. Look, I’m all for arrogant characters, but if you just got saved by someone in this contest you probably shouldn’t be talking tough for a while. The others may have also started out as villains, but at least they knew to stay quiet once the Mane 7 had pity on them. 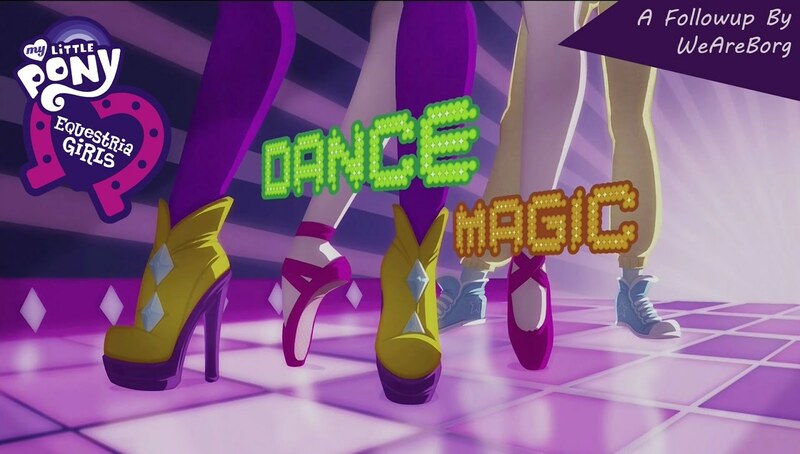 Overall, Dance Magic shows that it’s good to be kind, but you also have to be ready for all of the cheaters in the world. They aren’t going to just let you get past without a fight. It’s one thing to help someone out if they seem nervous, but if you’re in a competition you shouldn’t show off your routine before you have it securely patented and registered. Rarity taught us these valuable life lessons. If you haven’t seen this special yet then I’d recommend changing that. It’s pretty fun and easily works as an episode in the series. There was a brief theatrical short that played before the MLP movie so I figured I’d review this as well. It was very short so it’s not as if there was much time to get used to the movie. If the point of the special was to get me interested in the film then I can’t really say that it worked. It seems like a pleasant enough series though and I’m sure that it’ll get better but it just didn’t hook me. So there’s this little girl who is babysitting 4 stars. 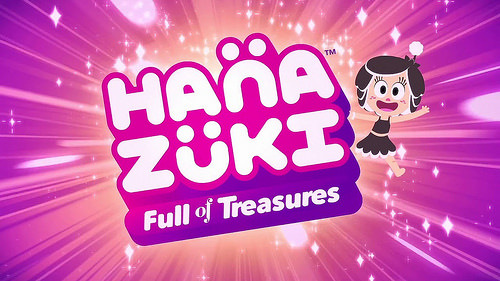 One of the Yellow stars is really petty and decides to steal Hanazuki’s gem that she got from a sleeping fairy and dashes off faster than you can say “Wakka Wakka.” Hanazuki chases after her mischievous friend and they land on the forbidden side of the moon. They are chased by a giant monster and nearly fall into the lava, but the monster has been moved by the power of friendship and saves them. Hanazuki then scolds the star by giving it a turn on the slide and everything is happily ever after. I mean, there wasn’t too much crude humor here aside from the monster drooling on the heroes every once in a while so that’s a good start. I think that the main problem here in the end is simply the fact that the characters aren’t as charismatic as the ponies. Whether you think My Little Pony is amazing or simply spectacular, the concept is fairly original. You can already get sold on the show by the fact that the characters are ponies and unicorns with mysterious powers. We’ve had a lot of human shows so one about them having fun in space can be fun, but it’s been done before. I think the characters are supposed to have powers as Hanazuki glows when she’s happy, but I’m going to need more moments like that to really sell the concept for me. Also, I already don’t like the mini stars. They just come across as really petty and are just dragging Hanazuki into trouble. At the end of the day, there wasn’t really anything wrong with the special though. At least it was over in a matter of minutes and didn’t drag on. It’ll be a pleasant enough series. Overall, there’s not much that this special can do for you one way or the other. 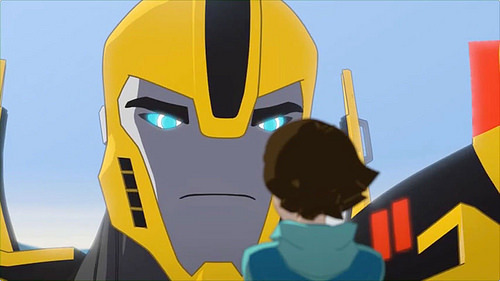 The animation isn’t bad, but it’s a clear step down from My Little Pony and doesn’t feel like something out of 2017. You can’t really tell if the series has a plot from this either. I hope fans of the show enjoy it as it gets longer and the lore gets explored more, but I won’t be taking that journey at this point. I wouldn’t mind if theaters started doing this more often though as having a short before a movie sounds pretty good to me. It just makes you that much more hyped for the film as you get a few extra minutes to shoot around theories in your head. It’s been a while, but time to finally check out the next Disney special. 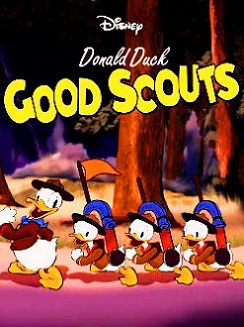 Donald Duck always makes for a pretty good protagonist and this time is no different as he tries to survive the harsh elements of the great outdoors. Unfortunately, he doesn’t tie up his tent correctly so he gets splattered with honey and then a bear attacks him. Can Donald stop the bear and get back to teaching his nephews what being a professional is all about or is he doomed? The special is super short as always, but it manages to capture the adventure rather well. The plot/pacing felt a lot tighter than usual which was really good as all of the scenes really had a purpose. When you have to tell a full story in roughly 10-12 minutes you really have to think through every scene to decide if it should be there or not. I can’t think of any scene that should have been removed. Donald was perhaps even more sputtery than usual as it could be hard to hear what he was saying, but it just increases the “Donald” effect that you like to see in his specials. His nephews were pretty solid this time around as well. They did at least try to stop Donald from nearly breaking his back on the stone tree. Perhaps they could have tried a little harder, but they did enough. Donald also recovered from it pretty well which is why he’s such a good character. He took the whole thing in stride and even decided to play a practical joke on his nephews. It may have failed in every sense of the word and I’m not sure about the spelling of the ketchup (Was the word copyrighted back in the day?) but it showed that Donald was ready to spread the chaos. It just didn’t work this time around. The animation is pretty fluid and consistent like you’d expect it to be. I do like these simple hand drawn days. 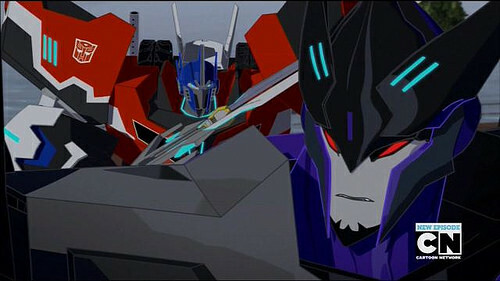 You can tell that the animators put a lot of effort into it and I still can’t imagine drawing frame by frame. That just sounds like soooo much work. There isn’t much of a soundtrack in this one, but we get all of the classic sound effects for the chase scene. You could feel the desperation in Donald as he struggled to escape before realizing that it was all ultimately futile. There is just no running away from a big bear. Overall, I enjoyed this special quite a bit. It’s easily one of Disney’s best shorts. The cast may have been a little smaller than usual, but it just meant that we got to see Donald more. I’m waiting for a special where he challenges Mickey to something like Basketball or Hockey so we could see his competitive side come out a little more. We know that Donald never gives up and is always bursting with confidence after all. Putting him in a situation like that would absolutely make for quite the spectacle. If you haven’t seen this special yet, then I’d advise you to do so ASAP. Prepare yourself for the somber ending though. Donald knows that he’s got to keep running because if it catches him….it’s game over. It’s time for another classic Disney review! In this special, Mickey Mouse is actually the antagonist for once. In my head canon, Mickey Mouse let the fame get to him and he forgot to look out for the little guys. As such, he is now the leader of a band and only allows top musicians to play with him. Donald tries to get in on the action, but Mickey reacts violently each time. He’ll have to think of something to get in on the act, but things get tough when a tornado sweeps through and carries them all off. 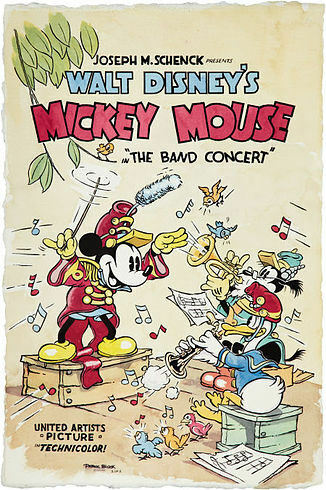 Can Mickey finish his song or will Donald interfere again? It’s a pretty entertaining special and I can see why people consider it to be one of Disney’s stronger ones. I thought it was more enjoyable than the others that I’ve seen as well. It’s pretty high energy the whole time. Sure, Mickey is pretty out of character, but it just goes to show that even he loses it once in a while. At least Mickey is super focused as not even the tornado could break his concentration. His team didn’t miss a beat and that’s why they’re considered as the pros. Meanwhile, Donald Duck did his best to fit in. He didn’t let the others get him down and came with a lot of flutes just in case. I’d say that he’s easily the best character in this special. Donald is a reminder to us all that nobody can stop you from playing your tunes except for yourself. This special was a little light on dialogue so we didn’t get to hear Donald’s iconic voice as much as I’d like, but it’s still always fun to see him on screen. Donald is certainly my favorite from the old Disney characters. Another bonus is that Goofy doesn’t get much to do here since it’s just a bunch of Goofy ripoffs in the band and none of them have any lines if I recall correctly. Most excellent! The actual song that the band was playing was pretty good as well. I definitely don’t mind old style songs for a special like this one. After all, something like Brave or Excalibur Clash wouldn’t fit so well right? I sometimes like to wonder what is better, to have a really epic song for something simple like baking a cake or to have a fairly uneventful theme playing the whole time. The latter would be forgettable, but the former would hint at something epic coming up and then you’d just be disappointed. It’s a tough question for sure. Overall, it’s fun to check out these retro specials. They’re really short so you can breeze through them, but the animation holds up well. Mickey Mouse and the others certainly got iconic through these shorts so Disney knew how to market even back then. Still, I doubt anyone could have ever guessed just how legendary they would ultimately end up being. There are a lot of specials so it’ll probably be a while before I see them all, but I’m getting there step by step. It’s time for a fun look at the classic Christmas Carol. I’ve seen many versions of this over the years and it’s a nice way to get prepared for Christmas. Mickey Mouse and the gang adapt this story well. As the special is very quick, they go through the 3 ghosts in record time. It may feel a tad too short at times, but it gets the job done. 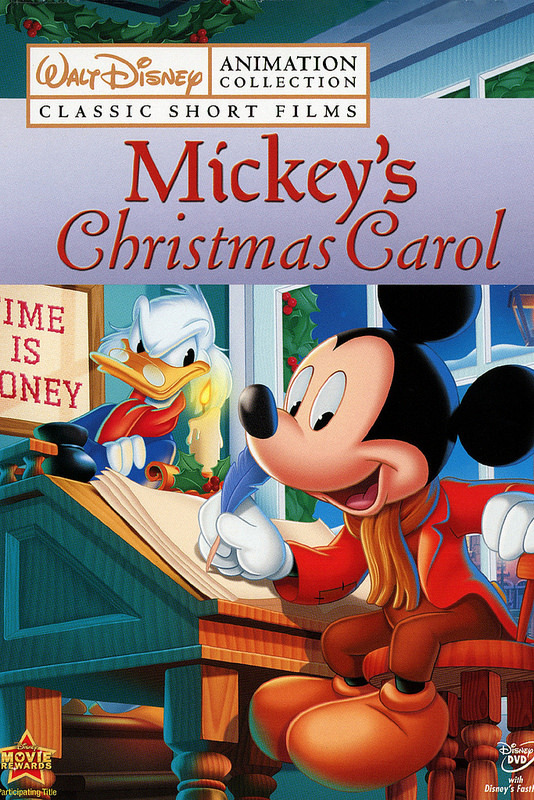 Scrooge does a good job portraying…Scrooge and Mickey Mouse has the solid one liners when necessary. It’s a fun special and there’s nothing to really dislike here. In case you don’t know the plot of the Christmas Carol, it follows a jaded old man. His name is Scrooge and money is the only thing that he likes. He has lived his life like this for many years, but this year is different. He is visited by three ghosts who show him the past, present, and future. If Scrooge doesn’t change his ways, he’ll be in chains for his whole afterlife and a little kid will die. Scrooge must see the value of Christmas or he will go down this dark path. Will he see the error of his ways? Scrooge is easily the best character here. Convincing the people trying to earn money for the poor that there work wasn’t going to end well was pretty strategic. Scrooge consistently shows that he is the smartest guy in the room. He also gets some of the best lines like when one of the ghosts said “It’s time to go” Scrooge responded with “Then go already!” As a cynical old duck, it’s fun to see him boss everyone around and try to sour everyone’s day. Only giving Mickey half a day off for Christmas shows just how strict he is. He even gave up his fiancee and then charged her for rent so he could get richer. Naturally, he’s not quite as fun once he turns into a nice guy, but it had to happen at some point. It would have been quite the ending had Scrooge decided that he just had too much Eggnog before bed and then went back to his old ways. It’s a rather sudden turnaround and it may not be all that believable, but it’s not supposed to be. Also, there is only so much that you can do for a character’s development in the course of 20 minutes. The animation is pretty fun and retro. This special certainly came out a long time ago and yet it looks a lot crisper and more modern than Charlie Brown and other similar cartoons from its time. Depends on how long of a period we call the same time era though. There’s not much of a soundtrack, but music wasn’t a really big focus in media back in the day. That’s just how it was at the time. The sound effects really stand out this way though so that’s a positive. Overall, This was a fun special. I still know these characters more from Kingdom Hearts than I do from the old classics so it’s neat to see them in their less serious forms for a change. It’s like looking at the characters before they peered into the darkness and learned how grave everything around them was. Donald’s voice is still perfect for all of his scenes. This special may not have gone out of its way for any exaggerated humor or forced jokes, but that’s exactly why it managed to be humorous. It’s a well written special and the kind of program that you couldn’t really expect to find nowadays. There’s just something to be said for these classic characters adapting such a classic story. I definitely recommend it for Christmas and I’m sure that I’ll be seeing more Christmas programs before the year is up. Frozen was definitely a fun film to watch. It really got extremely popular for a while there and I thought that it lived up to the hype. While a complete sequel would be nice to have someday, a 5-10 minute adventure is a nice sequel to have until then. There’s not a whole lot that you can do in that time, but the short does at least have a plot and while the animation isn’t quite as sharp as the film, you could picture this being a bonus scene in the special features or something like that. It is Anna’s Birthday so Elsa wants to make the day go perfectly. She sets up a large party area with cake, ice statues, and a lot of festivities. Then she also hides presents all around town so Anna can find them as they sing a song. It’s all going well at first, but then Elsa gets a fever and begins creating tiny snowmen that want to wreck the party. Can these little guys be stopped or is the party doomed to fail? Naturally, Anna cares more about Elsa’s health than celebrating too much. You can see where the special is going with this from the get go of course, but it’s not meant to be a deep plot anyway. It’s a fun little adventure and the only thing that will make you wince is that Olaf wrecked the Birthday cake by basically putting dirt on it. Not a cool move if you ask me, but at least the main characters had soup instead. Elsa did a good job of setting up the party and she’s still the best Frozen character. She’s also the only one to have powers though so I suppose that makes it a little easy for her. Her powers are so useful and great for just about any scenario. I do think that she should be immune to colds and fevers with those ice abilities of hers, but maybe she just hasn’t learned how to fully harness her abilities yet. That will come with time. 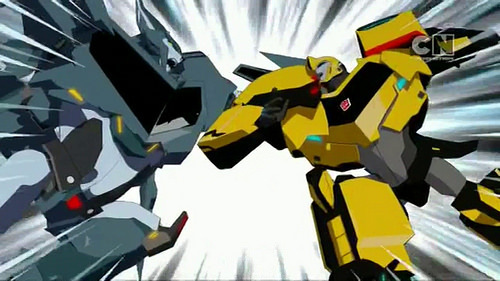 As mentioned earlier, the animation is good, but it’s not quite as sharp as the film. 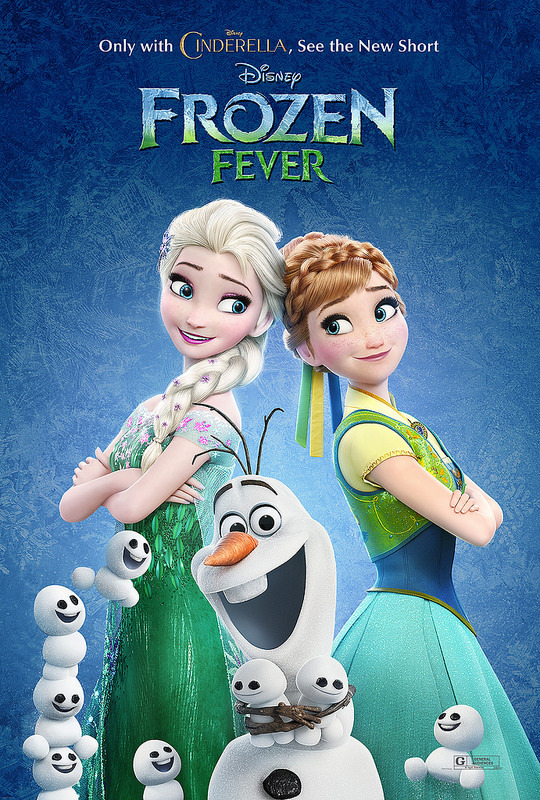 The main character that stands out is Elsa herself. She is sick in the film so she shouldn’t look like she’s at 100%, but even so, she just looked super tired right from the start. The dark rings under her eyes are really large as if she hasn’t slept in ages. It was mildly distracting and I don’t feel as if it was completely intentional, but maybe it was. The main song is fairly good. It’s no Let It Go of course, but few songs are. It works well within the context of the special. Overall, there’s not a whole lot more to say about this one. If you liked the Frozen movie then I definitely recommend seeing this short since it is one of the only ways to see your favorite characters again. Even if you haven’t seen Frozen, you will probably still enjoy the short. There’s nothing to really dislike and it is not as if you will lose a lot of time watching it. A few minutes will hardly make a big difference in the grand scheme of things and in the end you will be glad that you got to watch it. For a little short, Disney put a good amount of budget behind this.